This entry was posted on June 2, 2014 by Chris Elliott. 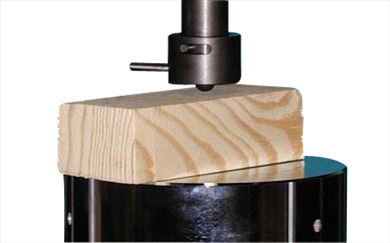 The most common way of measuring the hardness of a species of wood in the UK is by the Janka hardness test. It measures the hardness of the wood by pushing a steel ball (with a diameter of 11.28mm) into the wood. The measurement is then taken in relation to the force needed to push the ball into the wood by a depth of half the ball’s diameter. It basically measures the hardness of a wood species in comparison to other species. The higher the number, the harder the floor surface. From the table, it can be seen that Oak flooring, which is a very popular choice, has a medium hardness, whereas Walnut, which is another popular choice for hardwood flooring, is much softer, meaning that it would dent and scratch more easily. Lapachio is one of the hardest flooring materials around, but can be very hard to find and extremely expensive. If you are looking for a particularly hard floor then a fantastic alternative to hardwood is bamboo. Strand woven bamboo is more than twice as strong as Oak, is more eco-friendly than wood, but still offers a natural and luxurious appeal. The hardness of a particular flooring species should not be the only deciding factor when choosing a floor. Colour, pattern, grain, style, finish and cost also need to be considered. It is also beneficial to bear in mind that dents and scratches are inevitable to any flooring, regardless of its rating on the Janka hardness scale. The scale should only be used as a guide to help you to make an informed decision on which hardwood flooring to choose.